Cambridge need a bit of help. Go Ian! 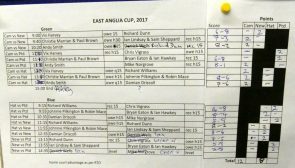 The EAC is an end of season tournie featuring our three neighbours Prested, Newmarket and Hatfield for (roughly speaking) 45-55 handicappers. The format is a round robin between the clubs with each tie being two Singles and one Doubles. It was our turn to host this year and Prested, the holders, had remembered to bring the Cup. 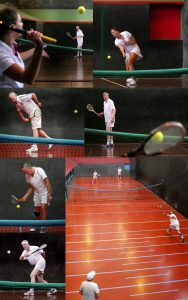 So, after about 150 assorted e-mails it was time to actually get on Court at 9am on Saturday. First up was Vix against Richard Dunn of Newmarket and a crucial game it turned out to be. Vix dug herself out of a hole at 4-1 to get back to 6-all before Richard edged it 8-6. 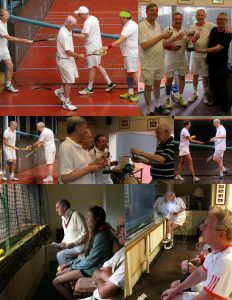 Vix had another tough loss against the experienced Grandpa Vigrass but came storming back against Hatfield’s Richard Williams. Andy Smith was in fine form winning his three matches and the Doubles combo of yours truly defeated the Hatfield and Newmarket pairs, the latter match being interrupted by a visit from the fire brigade following a direct hit on the alarm from an errant forehand. But alas we came unstuck against the Rose Bowl winning pairing of Prested’s Ian Hawkey & Bryan Eaton. In fact, we did a reverse Vix by letting a 4-2 lead slip before getting back to 6-all and then losing the last two games. 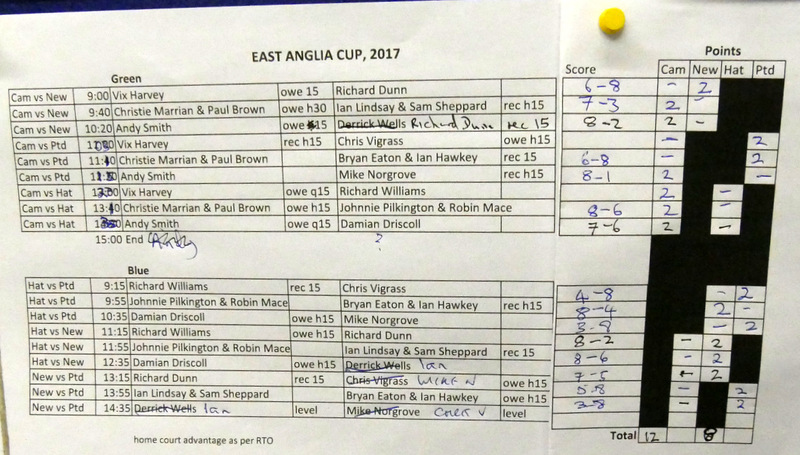 This proved to be the difference in the tally which saw Prested retaining the EAC with the final Score being: Prested 14, Cambridge 12, Hatfield 8 & Newmarket 2. Congratulations to Prested! We look forward to next year when we are off the Hatfield. This year we expanded the EAC to two days with the EAC Plus for 60+ handicappers on Sunday. This proved to be a three way match up with Hatfield pipping Prested to be the inaugural winners.